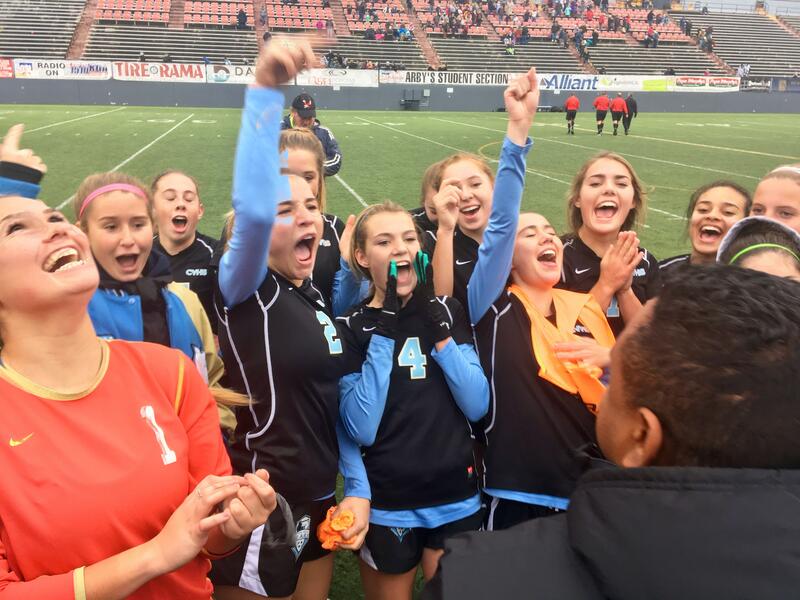 UPDATED: Thu., Nov. 16, 2017, 4:37 p.m.
By the lofty standards of Central Valley girls soccer coach Andres Monrroy, the Bears are having a B-plus season. The final grade won’t come in until Saturday night, when CV hopes to raise another State 4A championship trophy. “That’s always to goal – to get to state and win it,” said Monrroy, whose Bears took two consecutive in 2013 and 2014 before failing to get out of regionals the last two years. “We’ve come a long ways since last season,” said midfielder Megan Robertson, who scored a second-half goal to give the Bears a 1-0 win over University in the quarterfinals. “We’ve stepped up our game, and the bonds on the team are really tight,” Robertson said. The top-ranked Bears are 17-0 going into Friday’s semifinal match against Kennedy Catholic (16-3-1). Kickoff is at 6 p.m. at Sparks Stadium in Puyallup. Ball possession will be the key, Monrroy said. “Control the midfield and you control the game,” Monrroy said. Kennedy Catholic, from Burien, has outscored opponents 50-6. Three players have double-digit goals for the North Puget Sound League champs. Camas faces Issaquah in the second semifinal. The title match is Saturday at 4 p.m.
West Valley faces another daunting task Friday, but coach Shelli Totton and the Eagles are accustomed to that. After a 5-9 start, West Valley has ripped off five consecutive postseason wins going into a State 2A semifinal against Liberty (Issaquah). “The secret, I think, is that the girls realize that it’s either do or die, and they want to keep playing,” Totton said. Liberty (17-2-1) is one of the top-ranked teams in the state at all classifications. The Lancers haven’t lost since late September. “Our strategy is to play our game and pressure the ball as much as we can,” said Totton, whose club overcame a two-goal deficit to claim a 4-3 overtime win over Port Angeles in the quarterfinals. Kickoff is at 6 p.m. at Shoreline Stadium in Shoreline. Columbia River faces White River in the other semifinal. The St. George’s boys and girls will try to defend State 2B/1B titles this weekend at Sunset Chev Stadium in Sumner, Washington. The boys (14-1-1) will face familiar rival Prescott at 6 p.m. Friday in their quest to be the first school to win three consecutive 2B/1B championships. The winner will play Crosspoint or Orcas Island in the title match Saturday night. The St. George’s girls are a chasing a second consecutive title in only the fourth year of the program. The Dragons (10-4-1) face Brewster in a semifinal at 2 p.m. Friday, also in Sumner. Published: Nov. 16, 2017, 4:14 p.m. Updated: Nov. 16, 2017, 4:37 p.m.